Cuba’s "Special Period" was an economic depression that began in 1991 after the collapse of Cuba’s primary sponsor, the USSR. The depression peaked by the mid-1990s and decreased in severity by the end of the decade. Cuba also experienced an energy famine when oil imports dropped from 13 to 4 million barrels per year. Thus, Cuba was the first country to face the peak oil crisis, even though it was an artificial peak. This crisis transformed Cuba’s society and economy, as exemplified by the Cuban governments change of its 30-year motto from "Socialism or Death" to "A Better World is Possible", and led to the nationwide adoption of sustainable agriculture. Cuba’s successful transition from a peak- to a post-petroleum world teaches us many lessons that will be useful when our own countries are forced to make this transition in the near future. Because most of Cuba’s electricity was produced by burning oil, the oil shortage led to widespread blackouts. People could no longer rely on refrigerators, so their only option was to eat fresh food when it was available. Food shortages became the first problem to develop during the Special Period. To understand why, it helps to know that Americans consume 10 barrels of oil per year producing food, 9 on autos, and 7 on houses. Food shortages were exacerbated by an intensification of the U.S. embargo, which led to an 80% decrease in food imports. After the Green Revolution Cuba’s agricultural system was the most heavily industrialized in Latin America, but the oil shortage meant that they couldn’t use energy-hungry tractors or combine harvesters or transport the food great distances to consumers. Thus, farmers had to completely transform the agricultural system by relocalizing it and changing farming methods from those of industrial agriculture to permaculture. Society became more decentralized as people moved from cities to farms. People became more self-sufficient as they learned to produce their own food. This took 3-5 years, during which there were constant food shortages, and Cubans lost an average of 20 pounds. Government food distributions & rationing kept people from starving. But Cuba had some advantages: it had 2% of the population of Latin America but 11% of the scientists. Prior to the Special Period scientists had conducted research on sustainable organic farming, and once the need arose they implemented these methods nationwide. It took 3-5 years to make damaged soils fertile and productive again through systematic application of green manure (plowing green matter in) and compost and use of crop rotation. Nationwide farmers decreased oil-derived pesticide use from 21,000 tons to only 1,000 tons per year by using crop-interplanting methods and biopesticides. Now 80% of the food produced in Cuba is organic. The Cuban diet has changed in response: it is now more vegan-like, with greatly decreased consumption of meat, sugar and dairy products and increased fiber content. The urban agricultural movement was also effective. It started as a survivalist response on the part of individuals, but grew when entire communities began to convert idle neighborhood plots of land to community gardens. These communities used permaculture methods to create natural gardens on roofs and patios. Each neighborhood has a kiosk to sell fruits and vegetables. The impact of Peak Oil during the Special Period extended far beyond agriculture. To be politically independent Cuba had to be economically independent, which in turn required energy independence. Cuba now uses its own crude oil (which unfortunately is dirty and bad for the environment) and biomass to produce electricity, and Cubans now use one-eighth of the amount of energy that Americans use. Cubans now would rather sell their oil than use it. The collapse of the economy meant that money became worthless, and people were forced to switch to alternative currency systems such as bartering. People had to abandon their cars. In small towns people turned to horses for transportation. For transportation over short distances city dwellers could walk or use bicycles. For longer distances Cuba had to develop a mass transit system overnight. Even now mass transportation in cities is inadequate, so the current trend is to build mixed-use communities that are self-reliant because all amenities are local. Increased exercise and a switch to a healthier diet of fresh vegetables caused the health of Cubans to improve. Health care became decentralized, with doctors and nurses living in the same neighborhoods as their patients and paying house calls. Universities decreased in size but increased in number so they could serve local populations. The people of Cuba demonstrated impressive resilience during the Special Period. They were forced to live with less and to change their way of thinking and way of life, but they successfully adapted, and are still happy. Cubans survived despite their government’s planned economy; perhaps during "long emergencies" such as the Special Period it doesn’t matter what form of government you have as much as how resilient communities are. 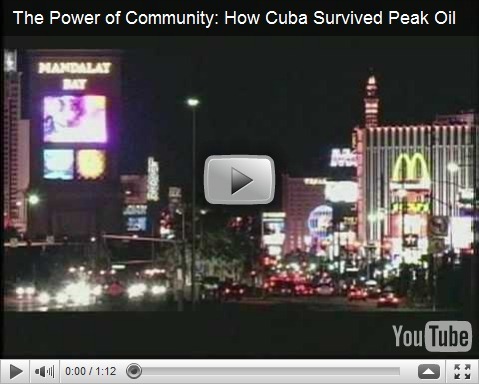 For more information see http://en.wikipedia.org/wiki/Special_Period and the video "The Power of Community: How Cuba Survived the Peak Oil Crisis"